See the new Verna in passing and chances are you’ll mistake it for the Elantra. Yes, the details are different and there is a visible difference in size too, but the Verna’s basic silhouette and design do make it appear very Elantra-like. And like the Elantra, the new Verna’s styling conforms to Hyundai’s Fluidic Sculpture 2.0 design language, so the look isn’t as flamboyant as the last-gen Verna’s, but this is a handsome car nonetheless. 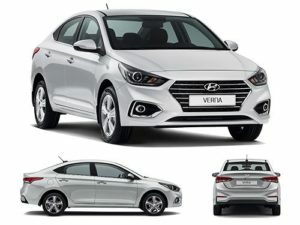 As on all new Hyundais, the centrepiece up front is the ‘cascading grille’ that does appear a bit large on the Verna but it helps add visual width to the car. Upswept headlamps and the shapely bumper, with chrome surrounds for the fog lamps, add distinction and definition to the front. The familiar glasshouse and neatly arced roof do link the new Verna to the last one but you won’t find any glitzy cuts or creases on the sides of this one. Rather, embellishments come in the form of chrome door handles and chrome piping at the window line. Sadly, the new Verna looks a bit ungainly when viewed from the rear three-quarter angle. The rear bumper that is shaped to aid air flow is bulky and even makes the top-spec Verna’s smart 16-inch wheels appear smaller than they are. However, the sleek tail-lamps add elegance to the look and are majestic with their LED elements lit. Last gen to current gen, the Verna has grown 65mm in length and also sits on a 30mm longer wheelbase. Interestingly, the new Verna is identical in length and wheelbase to the Honda City. And note that the similarities to the Elantra are not just skin deep. The Elantra’s sophisticated K2 platform also forms the basis for the new Verna. Structural rigidity is significantly up on the old Verna, with 50 percent (up from 13 percent) of the body shell made from light and stiff advanced high-strength steels. The cross members have also been strengthened to increase energy absorption in the event of a side impact. Hyundai has also worked to keep outside noise where it belongs and the engine mounts have been optimised to this end – there’s an insulator in the transmission tunnel and more noise absorbing materials have been employed in the region of the doors. And while the new Verna continues with an electric power steering and the familiar independent MacPherson struts up front and a non-independent, torsion beam rear suspension layout, Hyundai has revamped the entire setup for better comfort and driving dynamics. The top-spec SX (O) version is stuffed to the gills with features including ventilated seats, a hands-free boot release, push-button starter and leatherette seat covers. Sadly, the SX+ (the top-spec diesel automatic) misses on these and to top it off, there are silly omissions such as adjustable rear headrests and a release switch on the boot. The six airbags have been given a miss as well, and the top-spec diesel automatic gets dual airbags and anti-lock brakes like the rest of the Verna range. It does get the feel-good features, though, that include the one-touch open/close electric sunroof and the 7.0-inch touchscreen infotainment system with Android Auto, Apple CarPlay and navigation.If you’re seated at the rear, there’s enough to keep you occupied too. You get a manual rear blind, a set of rear AC vents, a central armrest and a USB charger for your phone. That said, you better have a long cable, because there’s no place to keep the phone. Also, there’s enough room for your luggage with the 480-litre boot (20-litre bump up). Yes, that’s not as much as the City (510-litres) or Ciaz (also 510-litres) – and you could say the same thing about the in-cabin space as well. But, in terms of quality of materials used and the equipment on offer, the Verna has definitely hit the ball out of the park. The new Verna carries forward the four-cylinder 1.6-litre petrol and diesel engines from the old model, though, they have been suitably tweaked for use here and also see revisions in their power and torque outputs. The dual variable valve timing-equipped petrol engine, for one, makes the same 123hp of max power as before but now does so at 6,400rpm rather than the earlier Verna’s 6,300rpm. And where the engine developed its 155Nm of max torque at 4,200rpm in the old Verna, it makes a marginally lesser 151Nm at a later 4,850rpm in the new car. Hyundai has also enhanced the engine’s low-end pulling power to ease drivability. At 1,500rpm, the engine makes 130Nm as opposed to 121Nm in the older car.The revamped power delivery characteristics, as well as the adoption of a six-speed manual gearbox in place of the old five-speeder, have had a measureable effect on performance. The new Verna petrol manual is not only quicker than the old car in flat-out acceleration and through the gears, but is actually the quickestof its peers in gears four and five, and all but matches the surprisingly brisk Maruti Ciaz in the third gear slog too. There’s a new-found flexibility to the engine, which is a boon in town and allows you to get by driving in a higher gear without much protest from the car. And it’s not that the pleasant gearbox or the light (if slightly springy) clutch are bothersome to use either, refinement levels arealso excellent at low revs so you’d just find yourself upshifting early by default. At times when you do hold on to the gear, the engine will rev cleanly to 5,000rpm, after which it takes its time to get to the 6,500rpm limiter. That Honda City VTEC-like manic top-end rush is, unfortunately, missing. Compared to the manual, the petrol automatic is quite different in character. It’s nice and well-mannered when you are ambling around town, but so much as hint at the need for more performance and, with a dab on the throttle, the six-speed torque converter automatic will respond readily, if a bit over enthusiastically, with a downshift and sometimes even two. Unlike typical new-age autos that are tuned to keep revs low for best efficiency, the Verna’s unit keeps revs around the 2,000rpm mark. While that gets you instantaneous responses from the engine, you also hear more of the otherwise quiet engine and get the feeling that the gearbox is perpetually in a sort of ‘Sport’ mode setting. You can take manual control via the gear lever to get the gearbox to behave as per your liking and it’s nice how responsive the system is.If you happen to be a high-mileage user, it’s the diesel Vernas that will be of greater interest to you. The 1.6-litre variable geometry turbo-diesel continues to top the segment for power (128hp) and torque (260Nm) but the crucial difference is that max torque is now available at a more accessible 1,500-3,000rpm, as opposed to the narrower 1,900-2,750rpm band in the last Verna. Also interesting is the fact that the six-speed manual gearbox runs shorter third and fourth gears here. We expected the new Verna diesel to be quicker than the old one and it is. The new Verna’s 0-100kph time of 9.32sec betters the old car’s class-best figure by 0.4sec, but what’s more telling is the improvement in in-gear acceleration. The new Verna is not mere milliseconds but full seconds quicker than the old car in benchmark roll-on times! 20-80kph in third gear takes 9.87sec to the old car’s time of 12.17sec, while 40-100kph in fourth gear takes 11.88sec to the old car’s 15.25sec time. Shorter gear ratios aside, the difference in performance is also down to how the updated engine produces its power. Where the old version of the engine bunched up its power for release after 1,800rpm or so, you get to the best of what the new version has to offer far earlier on. A Skoda Rapid or Volkswagen Vento diesel is quicker still in the gears, but where power from the VW TDI engine comes in a rush, the build of power is smooth and linear in the Verna. The Hyundai unit is responsive and likeable, and what makes it more likeable still is the high level of refinement. Sure, there is an audible clatter at middle revs but the sound seems relatively distant and is nowhere near as gruff or as loud as that emitted by other diesels in this segment. Noise levels do increase significantly as you extend the engine, but given the ready power on offer you’ll seldom feel the need to explore the top-end of the rev range. Once again, gearshifts on the six-speed manual gearbox are nice and the clutch, though springy, has a progressive action. You need to first have a go in the last-gen Verna to understand just how big a leap forward the new model has taken in terms of ride and handling. For starters, gone is the old car’s borderline scary, disconnected feel at highway speeds. What the stiff new Verna offers instead is a far more settled experience. It doesn’t move around half as much as the old car did and drives with a confidence and poise that was altogether missing then. There’s less vertical movement and even the odd bump taken at speed doesn’t ruffle the car as much. Further, the excellent road and wind noise insulation helps camouflage speeds; so on open roads you’ll have to keep an eye on the speedo to make sure you aren’t driving faster than you intended to. That said, not all Vernas are alike. The heavier diesel models offer better body control than the lighter petrols. Our petrol manual test car felt the least sure-footed of the lot but was still a country mile better than its floppy predecessor. The new Verna also brakes better. The pedal feel is good, stability under braking is impressive and braking performance is among the best in the class. However, should you find yourself in a panic-braking scenario, don’t be alarmed by judders at the pedal, as it’s the ABS at work and it’s tuned to kick in very early. On twisty roads, you’ll like the grip the Verna has to offer and the fact that it changes direction without much fuss. It’s just that the steering isn’t rich in feel and, on changing radius turns, the inconsistent way it weights up leaves you unsure of exactly how much lock to give. Sure, there’s less of that looseness in the steering and body even, but a Ford Fiesta (RIP) this is not. The lightness at the Verna’s steering does equate to less effort at parking speeds though. Hyundai Verna Ex-Showroom Price in Kolkata ranges from 7,98,068/- (Verna 1.6 VTVT E) to 12,86,734/- (Verna 1.6 CRDI SX Plus AT). Get best offers for Hyundai Verna from Hyundai Dealers in Kolkata.